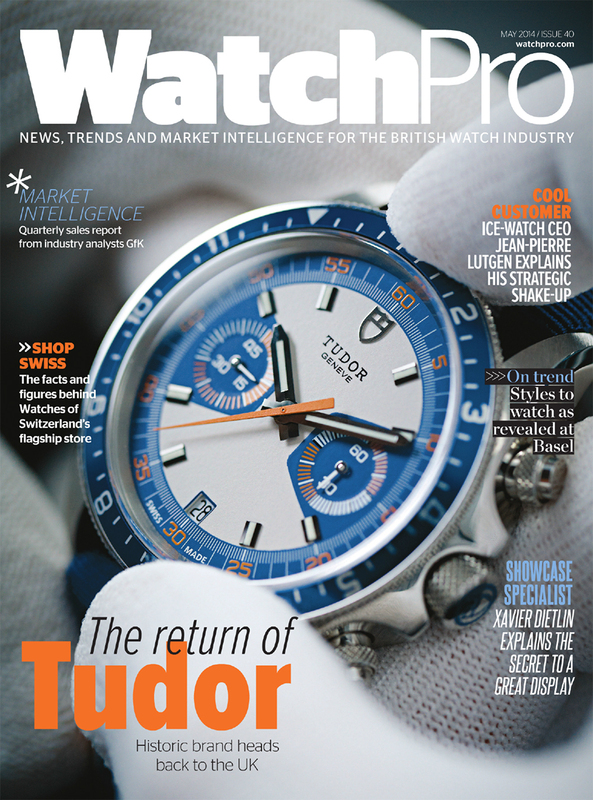 Dietlin Swiss Showcases - WatchPro: James Buttery speaks to elite vitrinist Xavier Dietlin. WatchPro: James Buttery speaks to elite vitrinist Xavier Dietlin. It’s one thing to have a collection of amazing watches to offer the public but uncovering the most astonishing ways of displaying them is something every retailer could benefit from learning. James Buttery speaks to elite vitrinist Xavier Dietlin, the man behind Basel’s most incredible showcases. Traipsing around Baselworld with a professional agenda and a focused calendar of appointments, it’s unlikely that many of us will have had much time for window shopping; that’s more the preserve of the show’s moderately-sized platoon of consumer watch enthusiasts. The WatchPro team averaged 15 appointments a day over six days and developed something approaching tunnel vision as we made our way from stand to stand and hall to hall. So it's easy to forget how consumers might have viewed the grand watch showcases on display at Basel this year. The chances are. if a watch was displayed in a manner that stopped you in your tracks, it was the work of one man -a former professional footballer who now operates at the vanguard of high-concept showcases, displays and merchandising. Xavier Dietlin's career in football, which included playing for Geneva's Servette FC and making five appearances for the Swiss national team under Roy Hodgson, may have been cut short by a serious knee injury, but he quickly found himself caught up in his father's metalworking business. There he applied his qualifications in industrial design and discovered a preference for small, fine detail projects over vast architectural work. A passion for fine watchmaking also steered Dietlin towards work with the Swiss watch manufacturers on his own doorstep and led to him becoming what the French describe as a Vitrinist which he tells me roughly translates as Showcasist. "What we do is showcases. What I like to do personally is to have different and unique showcases. I don't like products where nothing happens, the product is dead. What I like is to create some animations around the product to explain what it is, how complicated it is. I think that's the job. to create showcases with animation." He has developed showcases for the likes of Philip Morris, Nespresso and Samsung, but 90% of his work today revolves around watches and he's clear why. "Because it's so interesting. I'm based in Switzerland and I have all the watchmaking brands around me. less than 50 km away. I know everything about watchmaking and it’s so interesting. When you have to explain the product when you have to tell a story about the product for watchmaking it's very easy as there are so many things to say. For example, for cigarettes what can you say? Very difficult. " 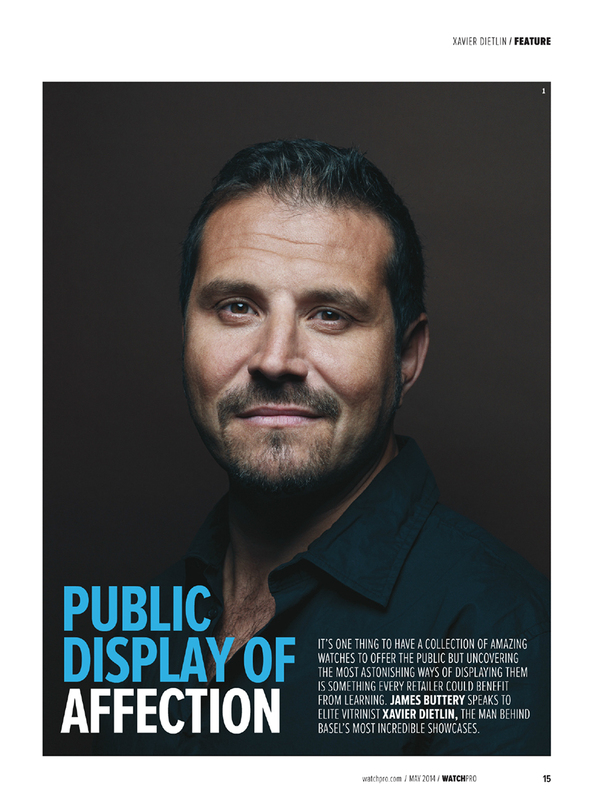 Dietlin's time would not be so heavily dominated by the watch industry if it wasn't something he was passionate about. 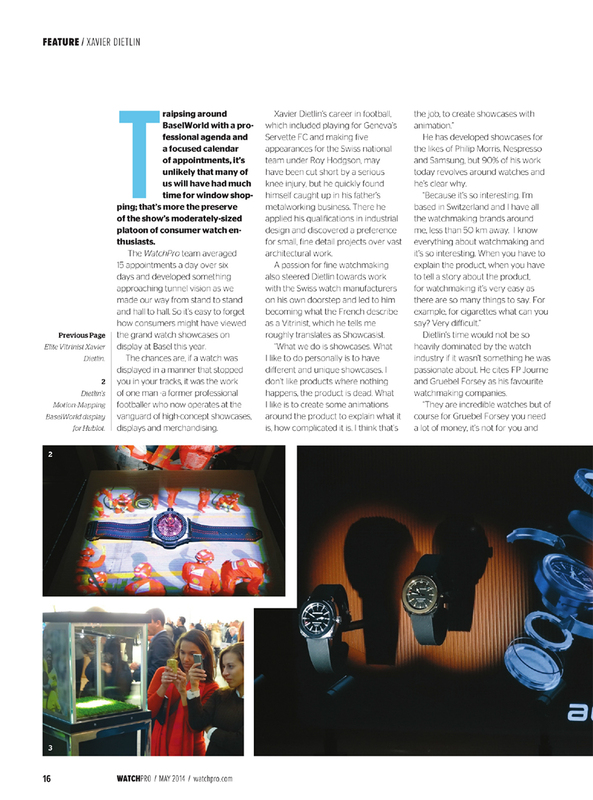 He cites FP Journe and Greubel Forsey as his favourite watchmaking companies. "They are incredible watches but of course for Greubel Forsey you need a lot of money, its not for you and me but it’s passion. What I don't like are brands that all the people know, for example I don't want to have a Cartier, I don't care about Cartier, it's a beautiful watch but not for me. What I want is to be unique and have something different. " This year Dietlin and his eponymous company, based on the outskirts of Lausanne, have worked on showcasing the work of Patek Philippe, Hublot, Bulgari, JeanRichard, Maurice Lacroix, Blancpain, Breguet, Anonimo and Jacob & Co at Basel. It's personal but for me I think maybe the best one was for Hublot with the motion mapping. It's like a projection on 3D objects with movement for Formula 1. It's very new because it is the first time we used the mapping and the projection in the very small sizes. It's very interesting because it is possible to use it day and night all over the world and the cost is not so expensive. The best demonstration is the Formula One for Ferrari. You have the watch and we project images on the watch. It's lighting, it’s animation, it's drawings. It's many, many things and the system can be very easily updated and it is very easy to use. It's a good idea. " Given that some of Dietlin’s work features holographic projection and even words forming from metallic liquids, you'd be forgiven for expecting that he operates at the cutting edge of technology with a scientific mindset and penchant for seeking out the next breakthrough. That couldn't be further from the truth.
" For me it doesn't matter if It's about technologic things, if it's poetic, if it's motorisation, if it's decoration. I don't care about that what I want is to create something unique, an experience. I'm not focused on the technologic things. I need it because it is very important today, to use this technology, but it's not the most important thing. The inspiration comes from everywhere, from observations, let's try to do something funny. Technology, you have to use it it's an obligation. But what we need is to view the showcases like a child. "Four years ago Dietlin developed a display for Chanel using FerroFluid. where the J12 Chromatic logo rose from a pool of metallic liquid. It looked like something from a science fiction film but as with much of his works. Dietlin adapts and refines existing techniques. "I saw the system, the first time someone used the technique was maybe 20 years ago. it's not really new but how we use it is new. Maybe I'd want to use it again, in two or three years, to create something different with the FerroFluid because it's funny when people don't know what it is they think maybe it's an image but its a real liquid, like steel, but in liquid. We use magnets, but without motorisation maybe the next time I will want to move it. the ferrofluid, and have it like a cascade. I don't know. " 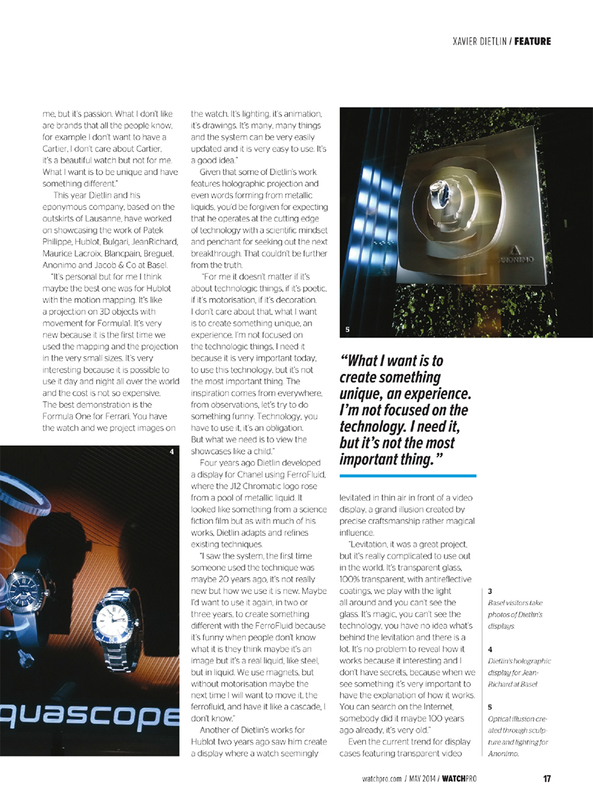 Another of Dietlin's works for Hublot two years ago saw him create a display where a watch seemingly levitated in thin air in front of a video display, a grand illusion created by precise craftsmanship rather magical influence. "Levitation, it was a great project, but it's really complicated to use out in the world. It's transparent glass. 100% transparent with anti reflective coatings, we play with the light all around and you can’t see the glass. It's magic, you can't see the technology, you have no idea what's behind the levitation and there is a lot It's no problem to reveal how it works because it interesting and I don't have secrets, because when we see something it's very important to have the explanation of how it works. You can search on the Internet, somebody did it maybe 100 years ago already, it's very old. 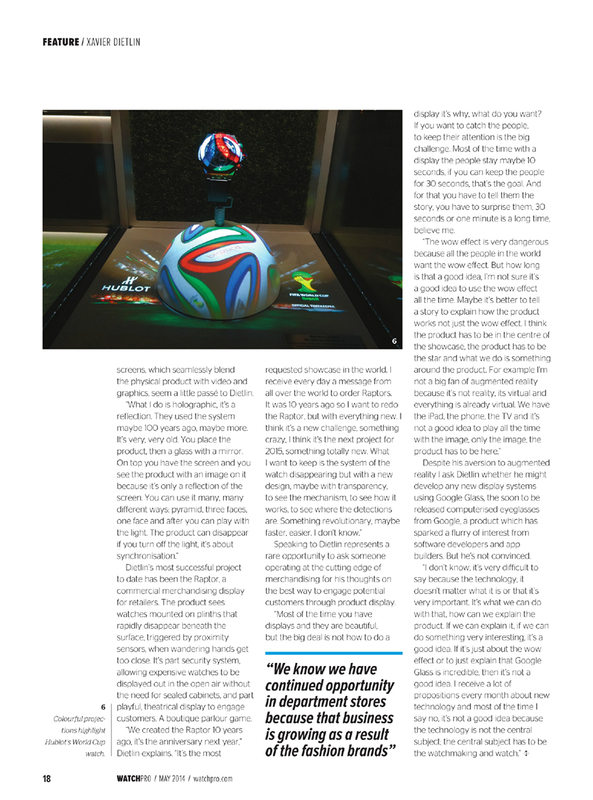 "Even the current trend for display cases featuring transparent video screens, which seamlessly blend the physical product with video and graphics, seem a little passe to Dietlin. "What I do is holographic it's a reflection. They used the system maybe 100 years ago. maybe more. It's very, very old You place the product then a glass with a mirror. On top you have the screen and you see the product with an image on it because it's only a reflection of the screen, You can use it many, many different ways; pyramid, three faces, one face and after you can play with the light The product can disappear if you turn off the light it's about synchronisation." Dietlin's most successful project to date has been the Raptor, a commercial merchandising display for retailers. The product sees watches mounted on plinths that rapidly disappear beneath the surface, triggered by proximity sensors, when wandering hands get too close. It's part security system, allowing expensive watches to be displayed out in the open air without the need for sealed cabinets, and part playful, theatrical display to engage customers. A boutique parlour game. "We created the Raptor 10 years ago. it's the anniversary next year,"
Dietlin explains. ' It's the most requested showcase in the world. I receive every day a message from all over the world to order Raptors. It was 10 years ago so I want to redo the Raptor, but with everything new. I think it's a new challenge, something crazy. I think it’s the next project for 2015. something totally new. What I want to keep is the system of the watch disappearing but with a new design, maybe with transparency, to see the mechanism, to see how it works, to see where the detections are. Something revolutionary, maybe faster, easier. I don't know. " Speaking to Dietlin represents a rare opportunity to ask someone operating at the cutting edge of merchandising for his thoughts on the best way to engage potential customers through product display “Most of the time you have displays and they are beautiful, but the big deal is not how to do a display it's why. What do you want? If you want to catch the people, to keep their attention is the big challenge. Most of the time with a display the people stay maybe 10 seconds, if you can keep the people for 30 seconds, that's the goal. And for that you have to tell them the story, you have to surprise them. 30 seconds or one minute is a long time, believe me. "The wow effect is very dangerous because all the people in the world want the wow effect But how long is that a good idea. I'm not sure it's a good idea to use the wow effect all the time. Maybe it's better to tell a story to explain how the product works not just the wow effect. I think the product has to be in the centre of the showcase, the product has to be the star and what we do is something around the product. For example I'm not a big fan of augmented reality because it's not reality, its virtual and everything is already virtual. We have the iPad, the phone, the TV and it’s not a good idea to play all the time with the image, only the image, the product has to be here. " Despite his aversion to augmented reality I ask Dietlin whether he might develop any new display systems using Google Glass, the soon to be released computerised eyeglasses from Google, a product which has sparked a flurry of interest from software developers and app builders. But he's not convinced. "I don't know, it's very difficult to say because the technology, it doesn't matter what it is or that it's very important. It’s what we can do with that, how can we explain the product. If we can explain it. if we can do something very interesting, it's a good idea. If it's just about the wow effect or to just explain that Google Glass is incredible, then it's not a good idea. I receive a lot of propositions every month about new technology and most of the time I say no. it's not a good idea because the technology is not the central subject; the central subject has to be the watchmaking and watch."